In 1886, the Swiss Julius Maggi, founder of the same-named company, established one of the first in-house PR departments to promote a consumer product: the Maggi Seasoning Sauce. The sauce, introduced in the same year as an affordable substitute for meat extract, has become extremely popular in German-speaking countries such as Germany, Switzerland, or Austria, but also Eastern European countries such as Slovenia or Poland. Maggi’s “Reclame- und Pressebüro” (Advertising and Publicity office), designed collateral such as posters and print ads and also managed press relations in house. Frank Wedekind, who would later become a famous German playwright, was made head of the department and came up with creative copy and numerous catchy slogans that contributed to Maggi’s success. Nowadays, Maggi is a Nestlé brand, of not only seasoning sauce, but also instant soups, bouillon cubes, ketchups, instant noodles and stocks. Julius Maggi, founder of the same-named company. 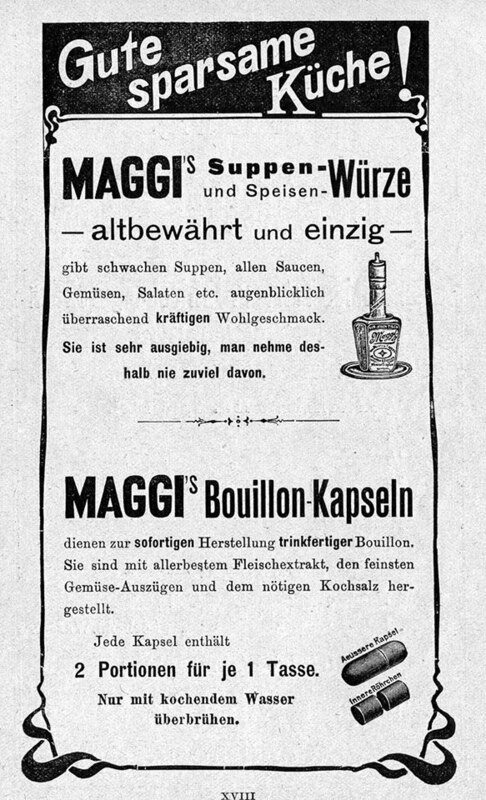 Maggi ad (in German), highlighting the distinctiveness, affordability and taste of the sauce. In 2011, Maggi celebrated the 125th anniversairy of its seasoning sauce.